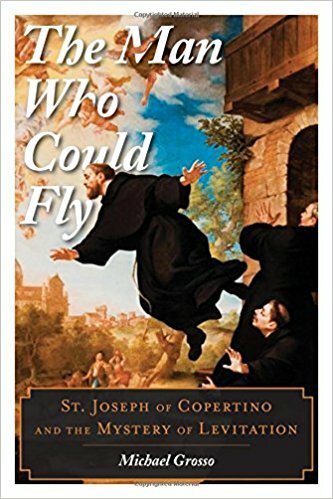 St. Joseph of Copertino (1603–1663) began having mystical visions at the age of seven, but it was not until he began practicing his faith as a Franciscan priest that he realized the full potential of his mind’s power over his body—he was able to levitate. Throughout his priesthood St. Joseph became famous for frequent levitations that were observed on hundreds of occasions and by thousands of witnesses, including many skeptics. Michael Grosso delves into the biography of the saint to explore the many strange phenomena that surrounded his life and develops potential physical explanations for some of the most astounding manifestations of his religious ecstasy. Grosso draws upon contemporary explorations into cognition, the relationship between the human mind and body, and the scientifically recorded effects of meditation and other transcendent practices to reveal the implications of St. Joseph’s experiences and abilities. Why did you choose to chronicle St. Joseph of Copertino? St. Joseph of Copertino was known as a great mystic with an array of supernormal powers. His case is well documented and I chose him because his story is a challenge to the dominant materialist worldview, which I think isn’t just false but pernicious, the foundation of all that is problematic today. Can you explain his levitations scientifically? I can describe the psychological and psychosocial background of Joseph’s levitations, which have some explanatory power. But the physics of levitation is a great mystery. However, modern physics may hold the answer. By pondering the mystery of levitation, science is forced to acknowledge the central role of mind in nature. This would imply breaking the paradigm that prevails in modern technological society. What lessons are you hoping the reader will take away from the book? First of all, to remind the reader of all the challenges to the mainstream reductive worldview. So there’s a critical leitmotif that runs throughout the book. On the positive side, I hope that readers gain a more vivid sense of the range and wonder of their own inner potential. Science keeps opening us to the wonders of physical nature; it should be equally open to the wonders of our internal environment: the infinite spaces of vision and imagination, and the various powers, mental and physical, latent in us all. Joseph is a striking example of how by regulating one’s internal environment, and simplifying one’s life style, it’s possible to experience the higher forms of conscious life. I have investigated levitation claims only in passing—and typically in the context of other “miraculous” and Fortean phenomena—but have read several interesting books trying to make the case for miracles from many decades or centuries ago, including that of stigmatic Padre Pio, holy man and fraud Sai Baba, magician Uri Geller, and others. My skeptical mind automatically focused on the phrase “large quantity of eyewitness documentation,” with an emphasis on large quantity (as in, “the plural of anecdote is not evidence”) and eyewitness. I was immediately reminded of a well-worn (and precisely identical) argument made for the existence of Bigfoot. Indeed, there is a vast quantity of evidence for Bigfoot: thousands of eyewitness accounts, hundreds of blurry and dubious photos and videos, hundreds of alleged tracks, and so on. I will be the first to admit that there is an enormous amount of evidence, including “a large quantity of eyewitness documentation,” for Bigfoot. The problem is that in science, quality of evidence is what’s important, not quantity of evidence. Just as you cannot combine ten cups of weak coffee into one cup of strong coffee, you can’t just point to stacks of dubious reports as if their sheer number is evidentially meaningful or scientifically convincing. In science, one anecdote is as good as the next, and a dozen rigorous studies are more valuable than a hundred flawed ones. Grosso’s claim that “if even a fraction of such accounts are well founded, there is a great deal to think about with respect to the nature of the mind” is quite true: If—after careful, thorough, science-based analysis—some of the accounts of any paranormal phenomena (ghosts, alien abductions, miracles, etc.) are real, then of course that means the whole phenomena is real. This is why it takes only one unequivocal Bigfoot body to prove that the creatures exist; one demonstrably extraterrestrial spacecraft to reveal the presence of interstellar space-traveling aliens; one proven, documented miracle to prove they exist; and so on. This is why it’s so important to carefully examine all the claims and hold the evidence to a high standard—to not merely lump them all together but judge each on its own evidentiary value. The Man Who Could Fly is a thrilling examination of our evolving understanding of consciousness and human abilities. Michael Grosso inverts the conventional dogma that matter makes mind by showing that mind shapes matter. Beautifully written and tightly reasoned, this book is a potent antidote to the suffocating, deadening effects of the materialist ideology of our time. The Man Who Could Fly is one of the most important explorations of consciousness thus far in the twenty-first century. A tightly reasoned examination of how human consciousness can affect matter? I figured it was worth a look and perhaps a brief interview with the author. I arranged to interview Grosso about his claims about levitation and his view of the paranormal. As I looked over Grosso’s book, I was reminded of another book about similar seemingly miraculous events attested to by hundreds of seemingly sober and sincere eyewitnesses centuries ago: The Rise of the Indian Rope Trick: How a Spectacular Hoax Became History by Peter Lamont (2004, Abacus Books). It’s an excellent historical examination of a world-famous illusion sworn as true by generations. Lamont explains that the idea (seemingly endorsed by Grosso in his book) that eyewitnesses to these miracles must be either telling the truth or lying is a false choice fallacy. Lamont explains in convincing detail how sincere people could and did see these seemingly impossible miracles occur. The books have much in common, including the levitation claims of medium D.D. Home. Though Grosso’s book is indexed and contains hundreds of references, skeptics are conspicuously absent, a predictable but unfortunate omission that might have better grounded his discussion of levitation. The book is also undermined by its endorsement of a hodgepodge of dubious and discredited phenomena ranging from Ted Serios (ably debunked decades ago by James Randi and others) to inedia (claims that people can live without eating through meditation and focus) to reincarnation. Though Grosso avoids the common New Age trap of throwing everything in but the kitchen sink, he comes close, with discussions of near-death experiences, ghosts, demonic possession, out of body experiences, astral travel, ESP, consciousness, and so on, most of which have only the most tenuous connection to levitation. In fact, only the first hundred pages or so deal with levitation specifically; the remaining 150 or so are spent speculating on what forces might account for (or be somehow related to) it. To me this was a clear violation of the skeptical principle that before trying to explain why something happened, be sure it did happen in the first place. In other words, I felt that Grosso should have spent more time exploring and ruling out alternative explanations for the phenomenon (if at all possible) before assuming that the extant documentation and evidence was adequate to proceed with the assumption that levitation is real. It reminded me of many Bigfoot books I’d read that filled pages of detailed speculation about the animals’ diet, hygiene, social order, and so on—neglecting to inquire too deeply into the question of whether they actually exist or not. What the authors should be trying to prove is simply assumed (without sufficient evidence, skeptics would argue), which is akin to pseudoscholarly disagreements by learned men regarding how many angels can dance on the head of a pin. In truth, the levitation claims about Copertino are largely an excuse for Grosso to hold forth an attack on scientific materialism. That’s fine, but by choosing such an objectively unproven phenomenon as levitation, Grosso somewhat undermines his larger goal. Grosso’s frequent references to Jung and Freud—along with their largely unfalsifiable if not wholly rejected theories—don’t help his case. The usual sympathetic suspects are quoted, including Dossey, Jeffrey Kripal, Ian Stevenson, Vallee, and others, with nary a Shermer, Randi, Radford, French, Alcock, or Wiseman among them. I pressed him on his seemingly credulous acceptance of eyewitness accounts. Radford: For example, as you know—and just to draw a parallel—there was also testimony in the Salem witch trials, people who claimed to be witnesses to witchcraft and Satanic activity. Do you think those were true and valid? Grosso: Do I accept all the claims of witchcraft? Certainly not. . . . But as to the objective reports of levitation, it’s possible in some instances there were misinterpretations, delusions, all kinds of possibilities. I’m not claiming that every report should be taken as valid. But I’m very discriminating in what I count as evidence. In the case of Joseph, to me, the evidence is overwhelming. I was slightly surprised that you were reaching back to a philosophical treatise from 120 years ago, instead of from modern physicists, to bolster your point. But there is a bigger issue: Doesn’t that violate Occam’s Razor? Grosso: Why? Why does it violate Occam’s Razor? In what sense does it violate Occam’s Razor? Radford: Well, if consciousness can be explained in principle as brain activity, then why do you? Grosso: But that’s the point. What I’m arguing is that it cannot; no one has come up with a viable theory. I have quotes in my book from materialists who admit this, but they don’t want to push the point as far as I am prepared to push because they’re not open to the reality of these paranormal phenomenon. I don’t see that there’s any violation of Occam’s Razor. I don’t agree with you that it applies in this case. Radford: This seems to me to be an “argument from ignorance” fallacy, albeit one I’ve seen often in discussions of psychic powers. It’s basically saying that a lack of knowledge about something is evidence for another claim. Because we don’t understand everything about the mind and brain, psychic powers can be explained by what we don’t know. Yet this is not a scientific or valid principle; whether psychic powers (or levitation) exist or not is completely independent of whether or not the brain (or consciousness) is perfectly and completely understood. Grosso: I’m enjoying your questioning all of this; I really prefer this kind of discussion, thank you for your thoughts. I also was enjoying the conversation. I was asking pointed but sincere and diplomatic questions and getting the same tone in return. It was the sort of exchange between two knowledgeable people that is so often missing from discussions. Grosso, author of a half-dozen books dating back to 1985, is an erudite man who has clearly done a lot of research. Though we had fundamental disagreements on key points, I could respect his work. Grosso: I agree, I completely agree with you about that, but what I am saying is that there are cases where there were careful controls. I cite some of them in my book. I agree with you about the fraudulent cases, but they’re not all fraudulent. I moved on to Grosso’s section on quantum physics. I’m not a physicist, but I’ve read the work of many people who are, and I was having difficulty reconciling Grosso’s depiction of quantum physics as a plausible mechanism for levitation with what I’d read. For example, in his Skeptical Inquirer article “Stop Heisenberg Abuse: Three Outrageous Misappropriations of Quantum Physics” (May/June 2014, pp.40–43), physicist and mathematics teacher Dale DeBakcsy explains that “Simply put, quantum effects stop being observable when the particles involved rise above a certain size. . . . When it comes to day-to-day existence, we’re really talking only about particles around the mass of an electron exhibiting anything like the finickiness toward measurement that we come to expect from quantum mechanics.” Humans, of course, do not operate or experience on the scale of electrons. It’s an excellent article, and I recommend reading it to get an accessible understanding of the conditions under which quantum effects are measurable; see also the late Victor Stenger’s article “Quantum Quackery” in the January/February 1997 issue of the same magazine. I agreed that the subject was worth talking about (though that’s a rather low bar—pretty much anything in the world is worth talking about) but trying to anchor the phenomenon in established facts seemed like trying to nail Jell-O to a wall. Grosso: No. No, I didn’t see anything like that. I’m not even sure what you mean by that. But the levitations took many forms, sometimes when (Joseph) was saying mass, he would levitate a few inches, other times he’d go thirty feet into the air and moved around like a bird. So, it’s a quite variously expressed phenomenon. I wasn’t convinced that there was really any sort of informal ban on studying paranormal phenomenon, despite having heard that claim for years (see, for example, my January 15, 2013, article on the Seeker network titled “Do Scientists Fear the Paranormal?”). If a person began levitating in a park or supermarket, and was witnessed doing so, I can’t imagine that scientists (or anyone else) would be in any way reluctant to investigate it because of any sort of fear of ridicule or other pressure. Instead, assuming that the phenomenon could be proven and not attributable to some known force—a gust of localized wind, for example—scientists around the world would be eager to research and study this previously unknown physical force. Grosso: I hope so. I’ve seen few things on the Internet. . . . It’s not something I’m constantly on the alert for, but yes, I would hope so. Radford: Are there any more recent reports of this happening? I mean, we’re basically talking 380 years ago for Joseph. Grosso: These things have continued into modern times . . . the reports are there, they’re hard to find. . . . We are dealing with a rare phenomenon that takes a variety of shapes and forms. . . . On one hand the rare manifestation throws us for a loop, but if you look at it as part of a large pattern of mind-body interactions, it becomes a little less shocking to one’s intellectual sensibility, at least that’s how I view it.